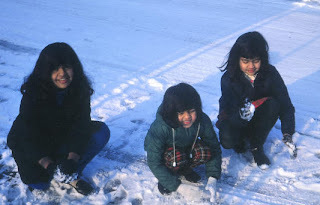 The Bose sisters' first snow in Flushing, Queens (Mitali in the middle), circa 1970. I'm doing several days of visits this week in Morris County, New Jersey, beginning with a dinner presentation Tuesday evening for the media specialists in the district. On Friday, I'll be heading to M.S. 217 (Robert Van Wyck School) in Queens, New York. I'm the first author to visit their school in years, so they're really excited. It's going to be a special visit for me, too; I'll be remembering an immigrant girl reading and writing out on a fire escape with no clue that she'd be back in Queens decades later as a visiting author.